While 2017 has been a great year for horror movies so far, it didn’t start out that way. Here’s a look back at one of the year’s earlier efforts, as well as being one of its more forgettable, from January, THE BYE BYE MAN (2017). THE BYE BYE MAN— what an awful title— opens in the 1960s, when we see an unhinged man with a shotgun chasing his family and neighbors, asking them if they’ve told anyone the name. Regardless of their answers, he kills them. He eventually kills himself, all in an effort to prevent the evil of the Bye Bye Man from being spread. But spread it does! The story jumps to present day where we meet three college friends about to rent an off campus house together. There’s Elliot (Douglas Smith) and Sasha (Cressida Bonas), who are dating, and John (Lucien Laviscount), who’s been Elliot’s best friend since childhood. It doesn’t take long before they realize they picked the wrong house to rent. At their house-warming party, attended by their college friends and Elliot’s older brother Virgil (Michael Trucco) and Virgil’s young daughter Alice (Erica Tremblay), it’s little Alice who discovers a mysterious gold coin in the upstairs bedroom. This coin later leads Elliott to find the words “Don’t say it! Don’t think it!” written inside a drawer which eventually leads him to more hidden writing, and this time it’s the name “The Bye Bye Man.” So, you can’t say it or think it, but I guess it’s okay to write it. Meanwhile, Sasha’s friend Kim (Jenna Kanell) who is psychic decides to give the house a psychic cleansing, and in an absolutely ridiculous scene in which she must be the most powerful psychic who ever lived because she knows every single answer to every single question naysayer Elliot throws her way, she eventually receives some bad vibes from the Bye Bye Man himself and quicker than you can say séance she makes like the bye bye girl and gets the heck out of there. Well, sort of. She does stay long enough to sleep with John. Anyway, the Bye Bye Man is unleashed and he begins to haunt our three fine college friends who find themselves experiencing strange delusions and having impulses to harm those around them. And they can’t tell anyone what’s going on because, well, you know, “don’t say it. don’t think it.” Say the Bye Bye Man, and it’s curtains for those you say it to. Whatever. These folks aren’t that clever. I mean, they don’t even try to become creative in communicating what’s going on. There are ways, after all, to get a message across without actually saying a name. Try “there’s something haunting us which we can’t think about or name” for a start. THE BYE BYE MAN is a dreadful horror movie that really isn’t worth your time. The acting is particularly bad. I thought the two leads, Douglas Smith as Elliot, and Cressida Bonas as Sasha were pretty awful. I didn’t find them convincing at all, and Smith goes through the whole film with a weird expression on his face, a cross between sadness and fright, regardless of what’s happening around him. The supporting cast was a bit better. Lucien Laviscount at least showed some personality as John, and I actually liked Jenna Kanell as Kim, the psychic girl. Doug Jones plays The Bye Bye Man, and we’ve seen Jones as other monsters as well, in OUIJA: ORIGIN OF EVIL (2016) and in CRIMSON PEAK (2015). Jones also played Abe Sapien in the HELLBOY movies. And in a bizarre bit of casting, Faye Dunaway shows up in a bit part as the Widow Redmon. Is this the best she can get nowadays? Very sad. The direction by Stacy Title isn’t any better. There are some awkward shots here, almost amateurish, during some scenes of dialogue, where the camera jumps from one character’s face to the other and often lingers there. It was just odd. In fact, it was so noticeable that the audience actually laughed a couple of times. It wasn’t smooth camerawork at all. In terms of shocks and scares, again, the audience was laughing. Not a good sign. In fact, I saw it in a packed theater— which I guess explains why these movies get theatrical releases, because horror movies make money. Although good horror movies would make more money!—and on the way out I heard several people say it was the worst movie they’ve ever seen. The script by Jonathen Penner was dull and redundant. Don’t say it. Don’t think it. How about Don’t repeat it? Over and over again we kept hearing the same phrase, and yet I left that movie not knowing much at all about who the Bye Bye Man was or what he was up to, which I guess is because nobody in the movie could say anything about him. How convenient. Let’s create a monster that the characters can’t talk about for fear of death and that way we don’t have to develop him! Er, no. The characters were also weak, and I wasn’t interested in any of them. I will say, that the first time we actually see the Bye Bye Man, I thought he looked kinda cool, but sadly, the more we see of him, the less cool he looks. And, the worst part is, that the Bye Bye Man has a buddy, and it’s, I guess, some huge carnivorous dog. Whatever he is, he’s the saddest looking CGI creation this side of those god-awful TWILIGHT wolves. THE BYE BYE MAN is a weak and forgettable horror movie. In fact, I have no problem with don’t think it, don’t say it, because lucky for me, I’ve already forgotten about it. You should too. Say bye-bye to THE BYE BYE MAN. Good riddance! BEAUTY AND THE BEAST (2017), Disney’s live-action remake of their beloved animated classic from 1991, succeeds for the simple reason that it’s still got those songs by Alan Menken. Everything else is gravy. I enjoyed this new version of BEAUTY AND THE BEAST so much I’m going to say something here that will be sacrilege for those who love the 1991 film version: I liked this new version better. Sure, I really liked the 1991 animated film and was glad it received a Best Picture nomination that year, but for me the best part of that film has always been Alan Menken’s songs. In fact, his score was so good I’ve always thought it really deserved to be in a film with real actors as opposed to animated ones. This 2017 version gives Menken’s music the platform it has always deserved. The plot, of course, remains the same. A handsome but selfish prince (Dan Stevens) is cursed for his meanness and turned into a hideous Beast. His servants are cursed as well, as they are all transformed into household items. Meanwhile, in a neighboring village, an “odd” farm girl Belle (Emma Watson) who would rather read books than marry the muscular village heart-throb Gaston (Luke Evans) lives with her equally eccentric inventor father Maurice (Kevin Kline). When Maurice becomes lost in the woods and finds himself at the Beast’s castle, he is taken prisoner there. Belle comes to his rescue and makes a deal with the Beast to take her father’s place. We then learn that in order to break the curse, someone must fall in love with the Beast, and the former servants who are now household objects believe Belle is this women, and they go out of their way to arrange a romance between Belle and the Beast. This 2017 version of BEAUTY AND THE BEAST is probably not going to receive the recognition which the 1991 animated hit received, which is too bad because it’s a very good movie. It’s grand entertainment from beginning to end. That being said, it’s not without flaws, but even these drawbacks don’t derail this two-hour and nine minute musical. Many have lamented that Disney chose as its director for this film Bill Condon, the man who directed the awful THE TWILIGHT SAGA: BREAKING DAWN – PART 1 (2011) and PART 2 (2012), but Condon also directed MR. HOLMES (2015), an intriguing tale of an aged, dementia-suffering Sherlock Holmes, and GODS AND MONSTERS (1998), an equally engaging movie about the later days of FRANKENSTEIN director James Whale, both films starring Ian McKellen in the lead roles, who also appears here in BEAUTY AND THE BEAST. Condon’s work here is closer in quality to MR. HOLMES and GODS AND MONSTERS than those horrible TWILIGHT movies. The film is colorful and beautiful to look at, the pacing is upbeat, and for a two-hour plus film it doesn’t drag at all, and the musical numbers are lively and satisfying. Emma Watson has also been receiving her fair share of criticism for a rather flat portrayal of Belle. Sure, Watson doesn’t play Belle like a princess. She plays her like a bookish farm girl who is more interested in imagination than romance, which is exactly how Belle should be portrayed. So, while I agree that at times Belle isn’t the most exciting woman on the planet, she’s not supposed to be. I thought Watson nailed Belle’s persona. I did have a little bit of a problem with the CGI used on the Beast, and it’s not that the Beast looked fake— he looked fine— but that he looked a bit too handsome. He’s not very beastlike in appearance. He’s not hideous or revolting or frightening. He’s pretty darn good-looking for a beast. I kept thinking of that line from the song “Werewolves of London”: And his hair was perfect. As the Beast, Dan Stevens does a serviceable job providing the voice, and even displays some well-timed humor when he’s the prince at the end of the movie. The rest of the CGI effects on the occupants of the castle are unusually understated and simple. Lumiere, Cogsworth, Mrs. Potts, and Chip all look rather plain. Some have interpreted this as inferior CGI, but I liked this effect. It kept the film from going down the road of high silliness. Kevin Kline turns in a nice performance as Belle’s father Maurice, and he enjoys some fine moments. But hands down the two best performances in the movie belong to Luke Evans as Gaston and Josh Gad as LeFou. Now, in the 1991 animated version, these two provided the comic relief and were over-the-top ridiculous. As such, they were probably my least two favorite characters in the 1991 version. It’s the exact opposite here. While they remain over-the-top and again provide comic relief, both Evans and Gad add so much more to their performances, giving these characters nuances which simply weren’t there in the original. Evans, as the handsome cad who every woman in the village other than Belle pines for, plays this aspect to the hilt, but he also grounds the character with a sense of military realism that makes Gaston more of a three-dimensional villain here. As good as Evans is, Josh Gad is even better as LeFou. He provides several laugh-out-loud moments in this movie, and he makes LeFou much more than just the mindless bumbling sidekick we saw in the animated version. This LeFou is a real person. Much has been made about the gay angle of the character, and all I can say is it works wonderfully and it’s a natural progression for the character. Ewan McGregor is serviceable as Lumiere, but the rest of the cast is hardly noticeable, and this includes some big names. Ian McKellen barely registers as Cogsworth, and Emma Thompson, while fine as Mts. Potts, doesn’t stand out either. Even Stanley Tucci is restrained as Maestro Cadenza. But somehow, none of this really gets in the way of the success of this movie. And to come full circle, the reason again is the music by Alan Menken. Somehow, those songs sound even better today. Menken’s music score and songs have always cried out for a live action rendition. The 2017 version of BEAUTY AND THE BEAST is that rendition. And while he’s still king when it comes to defending Skull Island from giant monsters and aggressive humans, he’s not so adept at overcoming a bad script. KONG: SKULL ISLAND is a new King Kong movie, produced by the same folks who made GODZILLA (2014), the one with Bryan Cranston. As such, it’s not a sequel to Peter Jackson’s KING KONG (2005), but as most everyone knows by now, a new story to set up a future King Kong vs. Godzilla bash which is scheduled for release in 2020, which is why Kong has been taking steroids. Yup, in this movie, Kong is huge! Whereas in the Peter Jackson movie, Kong stood at 25 feet tall, here in KONG: SKULL ISLAND Mr. Kong stands at a towering 104 feet tall. The 25 feet tall is comparable to Kong’s height in the original 1933 film, and the tallest Kong appeared in KING KONG VS. GODZILLA (1962) where he stood at 147 feet. Also going along for the journey are professional tracker James Conrad (Tom Hiddleston) and war photographer Mason Weaver (Brie Larson), as well as various other military folks and scientists who are just as under-developed as these main characters. When they get to Skull Island, it doesn’t take them long to encounter Kong who quickly makes short work of them, downing their helicopters and killing most of them. Those who survive find themselves scattered on the island, but they know of a rendezvous point where more helicopters are scheduled to arrive to pick them up, and so they know if they can get there, they can be rescued. 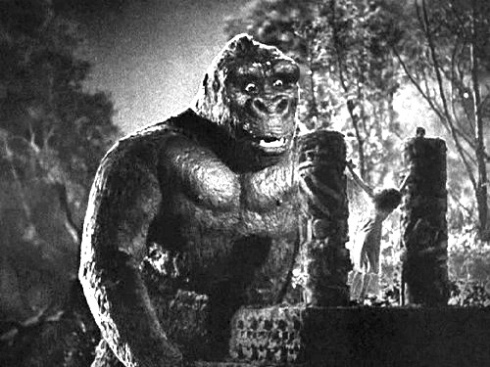 Of course, Kong and the other giant creatures on the island have other ideas. 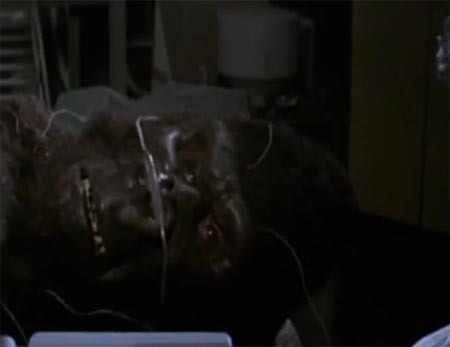 While I wouldn’t call KONG:SKULL ISLAND the worst Kong movie ever made— that distinction still belongs to the utterly horrible KING KONG LIVES (1986)— it’s certainly one of the stupidest Kong films ever. What a ridiculously inane story! First of all, it’s not a new story at all. While technically not a remake of the original Kong tale, it basically tells the same story: a group of people travel to an uncharted island in search of something monstrous that supposedly lives there. 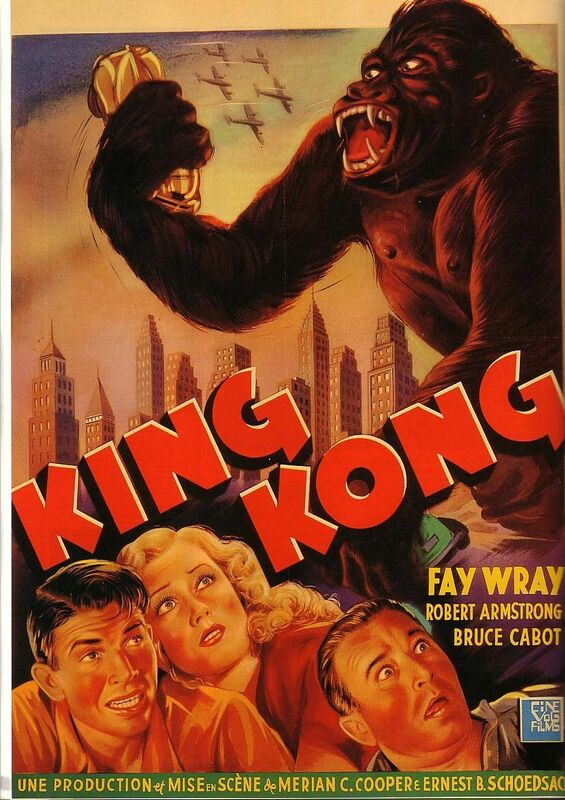 It’s the same exact story, only without the Fay Wray character. This is the best the writers could do? Don’t be fooled. KONG: SKULL ISLAND is not an original tale. It’s just another origin story, and we’ve already had plenty of those. They’ve been called KING KONG. Sure, here it’s been altered to fit into a Vietnam era tale, but these alterations only make things more ridiculous. I’m not really sure why there is a Vietnam connection. It’s obvious from the film’s poster that the filmmakers are going for an APOCALYPSE NOW (1979) connection. And while there’s plenty of cool 1970s songs on the soundtrack, along with wise cracking soldiers, none of it really works. It all just feels out-of-place. Director Jordan Vogt-Roberts does the film no favors with a choppy style that is more reminiscent of TOP GUN (1986) than APOCALYPSE NOW. Like TOP GUN, there are lots of characters who we never really get to know, often shown in brief music video-style clips which serves as a substitute for genuine character development. The screenplay by three writers with considerable screen credits—Dan Gilroy, Max Borenstein and Derek Connolly is pretty bad. It’s chock full of awful dialogue, and the only reason folks like John Goodman and Tom Hiddleston say their lines with straight faces is because they’re really good actors. And the story is a snooze. It’s an origin story disguised as monster movie/war movie hybrid, and it just doesn’t work. Gilroy wrote NIGHTCRAWLER (2014), Borenstein co-wrote GODZILLA (2014), and Connolly co-wrote JURASSIC WORLD (2015). KONG: SKULL ISLAND is not their best work. 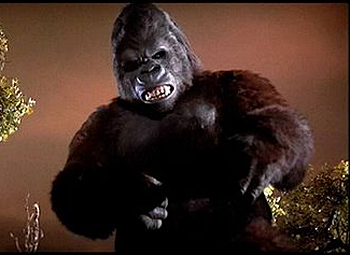 Back in 1976, critics made fun of the fact that in the 1976 remake of KING KONG, Kong walked upright like a man, which was a clear departure from the way he walked in both the original 1933 classic and in the ensuing Japanese Toho productions. 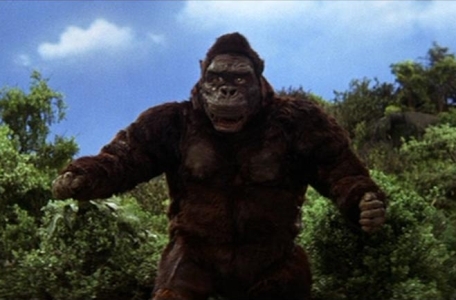 Kong was a giant ape and was supposed to walk like an ape. To be honest, I never had a problem with Kong walking upright in the 1976 version, as it is an interpretation which suggests that Kong is not just a giant ape but a different creature altogether. This interpretation makes Kong more monstrous. I bring this up because here in KONG: SKULL ISLAND Kong once again walks upright. I don’t have a problem with this. However, I do have problems with Kong in this movie. While Kong looks fine, he has to be the most boring King Kong ever to appear in a movie. In every Kong movie, even the Toho films, Kong has a personality. He is a definite presence in the film. He has no personality here. In KONG: SKULL ISLAND, Kong is nothing more than a slow-walking giant who battles both humans and monsters and that’s it. Not that I’m arguing that every Kong movie has to be a love story between Kong and a woman, because that’s not what I’m talking about. In other films, Kong has been angry, Kong has been heroic, and Kong’s has been ruthless. 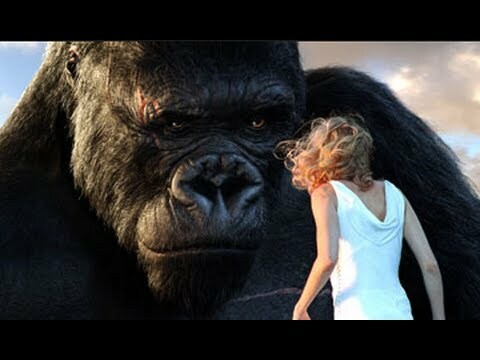 It’s these emotions which have set Kong apart from other giant monsters in the movies, and while Kong goes through the motions in this movie, I never felt these emotions at all. It’s one of my least favorite Kong interpretations of all time. One thing the movie does have going for it is it is full of good actors, and so you cannot argue that the acting is bad here. In fact, the acting in spite of the silly script, is one of the film’s best parts. Tom Hiddleston, who plays the villain Loki in the MARVEL superhero movies, a character I have never liked, is very good here as hero tracker James Conrad, in spite of the laughable dialogue he has to say. The same can be said for John Goodman, who plays adventurer Bill Randa, a sort of Carl Denham character— in fact, the clothes he wears in this movie are an homage to the clothes Denham wore in the 1933 original film—and who has to say even worse dialogue. Brie Larson also does a fine job with Mason Weaver, although like every one else in the movie, her character is way under developed. Samuel L. Jackson probably fares the worst, because in addition to his lousy dialogue, his military character is strictly cliché, the type of character who always seems to show up in a giant monster movie, the military officer who takes out his misplaced frustrations on the giant monster, vowing to kill the creature at all costs. Blah, blah, blah. The most interesting character in the film is Hank Marlow (John C. Reilly) a World War II pilot who was shot down during the war and has been living on Skull Island ever since when he is discovered by the folks in this movie. Reilly has a field day with the role, and he has all of the best lines in the movie. In fact, the story of KONG: SKULL ISLAND is really the story of Hank Marlow. The film begins with him being shot down, and the entire story arc in the movie which goes all the way into the end credits follows his tale, not Kong’s, which would have been okay, had I bought a ticket to see HANK MARLOW: SKULL ISLAND. Surprisingly, there are not any dinosaurs on Skull Island, this time around, but there are plenty of giant creatures. Some work, others don’t. I liked the giant spider and the bird creatures, but Kong’s main adversary in this film, giant reptilian creatures which come out from underneath the ground, did not work for me. I thought they looked really silly. The giant spider is an homage to the giant spider in the pit scene from the original KING KONG (1933) which was cut upon release, lost, and has remained missing ever since. 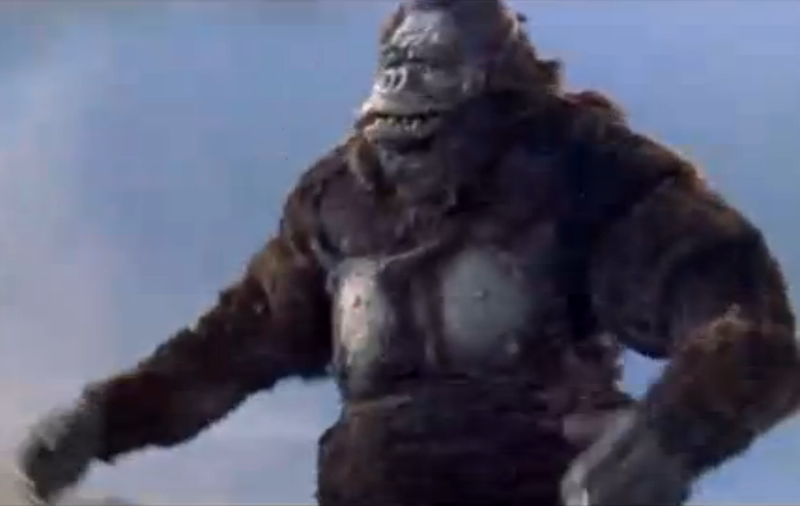 Kong’s fight with a giant octopus is also an homage to a similar scene in KING KONG VS. GODZILLA (1962). There is an after-credit scene, but I didn’t stay for it. I had had enough by the film’s end. KONG: SKULL ISLAND isn’t really all that intense. In fact, you can make the argument that the 1933 original KING KONG is a far more intense film than this 2017 edition. I love King Kong and I’m a huge fan of the King Kong movies, both the good and the bad, and so I can’t say that I hated KONG: SKULL ISLAND. I just thought it was really stupid, and I didn’t particularly like the interpretation of Kong in this movie. The actors all do a good job, but they’re in a story that doesn’t help them at all. KONG: SKULL ISLAND is certainly one of the weaker films in the KONG canon. Since Christopher Lee was not interested in playing Dracula again after Hammer Films’ megahit HORROR OF DRACULA (1958), (it would take him a few more years to change his mind) Hammer made a sequel without him, THE BRIDES OF DRACULA (1960), in which Peter Cushing reprised his role as Doctor Van Helsing. And after the success of THE BRIDES OF DRACULA, Hammer decided to follow it up with another vampire movie, KISS OF THE VAMPIRE (1963), this one without either Lee or Cushing, and without their A-List director, Terence Fisher. It was directed by Don Sharp. All this being said, while not as highly regarded as some of Hammer’s best vampire movies, KISS OF THE VAMPIRE is nonetheless a well-made, well-acted, and extremely atmospheric vampire movie. If not for a poorly conceived and executed conclusion, it would have been even better. KISS OF THE VAMPIRE opens with a chilling pre-credit sequence which is quintessential Hammer. As the village priest leads a burial ceremony, complete with grieving townspeople, a man Professor Zimmer (Clifford Evans), arrives upon the scene. Taking a shovel, he drives it into the loose soil of the girl’s grave, causing a fountain of bright red blood to gush from underneath the ground. Cue James Bernard’s rousing music score. It’s a perfect beginning to another atmospheric Hammer vampire film. A young couple Gerald (Edward de Souza) and Marianne Harcourt (Jennifer Daniel) on their honeymoon arrive in a small European village, stranded there temporarily when their car runs out of petrol. They are invited to the castle overlooking the village, and there they meet their host, Dr. Ravna (Noel Willman) who introduces the couple to his family, which consists of his son and daughter, and he promises to get them some petrol so they can continue their journey. In the meantime, Dr. Ravna invites Gerald and Marianne to a party at the castle. It seems like the perfect idea, until Gerald and Marianne realize that their hosts— and in fact all the guests— are vampires! We’ll take that petrol now, thank you very much! When Marianne is abducted by this undead family, Gerald turns to the knowledgable Professor Zimmer for help in saving Marianne and destroying the vampires. KISS OF THE VAMPIRE has a lot of things going for it. First off, it looks fabulous. In terms of atmosphere and capturing that whole vampire feel, it’s up there with THE BRIDES OF DRACULA (1960). Director Don Sharp deserves a lot of credit for the way this one looks. And while its story is nothing new— young couple runs afoul of a vampire in a remote European village— there are parts of it that are refreshing. For instance, instead of one vampire, we have a family of vampires, and eventually an entire congregation of vampires. The Ravna family is charming, hospitable, and friendly. They don’t seem like vampires at all. It’s easy to see how Gerald and Marianne let their guard down so easily. And unlike the traditional black and red garb that Dracula wears, Ravna and his vampires wear white robes. Producer Anthony Hinds wrote the screenplay under his pen name “John Elder.” Hinds wrote a lot of Hammer Films, including some of their best, films like THE CURSE OF THE WEREWOLF (1961), THE EVIL OF FRANKENSTEIN (1964), and DRACULA HAS RISEN FROM THE GRAVE (1968), to name just a few. It’s an intriguing screenplay. There are things, however, that don’t work all that well. For starters, Noel Willman is no Christopher Lee. His vampire Dr. Ravna is a little too non-vampiric. He comes off as polite and gentlemanly, with just a touch of vulgarity. He’s hardly sensual, and the scenes where he commands his vampire women to do his bidding are difficult to believe. The best part of his performance is it’s easy to believe when village officials refute accusations that he’s a vampire since he’s the area’s most upstanding citizen. Willman pulls off this side of Ravna’s personality with ease. The problem is he doesn’t do much with the other side, the darker side. He’s not much of a vampire. Barry Warren and Jacquie Wallis are both rather wooden as Ravna’s adult vampire children, Carl and Sabena. The best vampire performance in the movie belongs to Isobel Black as Tania, one of the village girls held captive by the Ravnas, who is turned into a vampire. Black’s Tania is sensuous, mesmerizing, and eager to drink blood. Edward de Souza makes for an amiable hero as Gerald Harcourt, although he does tend to overract a bit at times, something he didn’t do in his earlier Hammer Film appearance, in THE PHANTOM OF THE OPERA (1962). Jennifer Daniel is less effective as heroine Marianne Harcourt. She’s rather blah. And as the main hero, the eccentric Professor Zimmer, Clifford Evans does an adequate job, although just as Noel Willman is no Christopher Lee, Evans is no Peter Cushing either, and Zimmer is no Van Helsing. KISS OF THE VAMPIRE definitely misses a strong presence like Cushing or Lee. But Evans is a very good actor, and in the scenes where Zimmer is not drunk, Evans makes him an effective vampire hunter. While director Don Sharp makes KISS OF THE VAMPIRE a very atmospheric vampire movie, he doesn’t handle the horror scenes as well. The scene where Harcourt and Professor Zimmer rescue Marianne from Ravna’s clutches lacks punch, and there really aren’t any memorable shock scenes in this one, other than the pre-credit sequence. The conclusion where Professor Zimmer uses a black mass ritual to destroy the vampires was originally conceived for THE BRIDES OF DRACULA (1960). The vampire in that movie, Baron Meinster, was supposed to have been torn apart by a horde of vampire bats, unleashed by a ritual performed by Dr. Van Helsing, but Peter Cushing balked at this idea, claiming that Van Helsing wouldn’t resort to the dark arts to defeat a vampire, a decision I believe he was spot-on with. So writer Hinds went with that idea for his ending to KISS OF THE VAMPIRE. While it’s an intriguing idea, mostly because having bats attack and destroy your vampires is pretty unique when it comes to vampire movie endings, I’m still not sure I understand it. Professor Zimmer says his ritual will in effect turn the forces of darkness on each other, but I’ve never understood why this happens. What is it that Zimmer does that makes the vampire bats attack the vampires? Are they confused? Vengeful that the vampires allowed Zimmer to perform this ritual? It’s never clearly explained in the movie. The sequence is ultimately done in by inferior special effects. The incoming swarm of vampire bats descending upon the Ravna castle is filmed with cheap animation, looking like the bats in SCOOBY DOO cartoons. The bats inside the castle look just as fake and don’t look any better than the bats used in the old Universal Dracula movies. In fact, in color, they actually look a bit worse. As such, KISS OF THE VAMPIRE has never been one of my favorite Hammer movies. It’s not bad, but it lacks the sensuality and horror usually associated with the best of the Hammer vampire flicks. Then again, if the vampiric Tania were to show up at your bedroom window in the dead of night, I doubt you’d be able to turn her away. In fact, I’d wager to guess you’d be powerless to prevent her from giving you the KISS OF THE VAMPIRE.